The first impression is everything when it comes to real estate. In fact, experienced real estate agents and landlords would agree that photos can either make or break a potential property deal because of a bad first impression. Hence, knowing how to take advantage of photography is important for all property sellers and landlords. There’s more than one good reason why you should consider using professional grade photographs to advertise your property in the open market. New property hunters, particularly the millennials, overwhelmingly search through online resources in order to find properties of their choice. In fact, according to data, roughly 90% of homebuyers take advantage of online property listings. However, the most important part of this online search involves looking through photographs of properties, with listings having no or just one or two photos receiving considerably fewer clicks compared to others. Research conducted to understand the impact of photographs on online property listings have revealed that houses with professional grade photos on average generated 139% more clicks from potential homebuyers compared to house listings that did not hire an expert photographer for the job. The result was the same for sellers who decided to take photos by themselves using either a low quality mobile phone or point and shoot camera. Whether you believe it or not, property listings with good photographs can actually generate property offers that can exceed the original asking price. In fact, according to experienced real estate professionals, properties that had higher-quality photographs received property offers that were 47% higher than the seller’s original asking price due to the excellent first impression created from those photographs. The difference between property listings that do not incorporate photographs to advertise themselves vs. listings that use professional grade photos is 10 times greater. According to real estate market research, it was discovered that a property listing that did not take an effort to add a cover photo only had around two seconds to grab the attention of a property buyer. On the contrary, a listing that had a high-quality cover photo had around 20 seconds until a buyer decided whether to click or not. 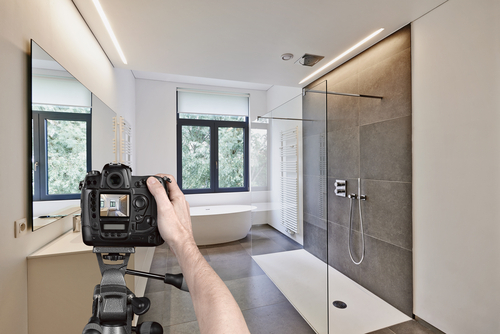 If you decided to take the photos yourself or hire an amateur photographer to do the job, then make sure to avoid these common mistakes as much as possible, in order to give your property the best chances online. A common mistake property owners do when they try to photograph the property by themselves is to take unimpressive interior photos of the corners of their homes. It’s even worse if the corners are empty with no furniture or anything interesting such as wall photos. The issue is psychological, as potential homebuyers may find your property to be uninspiring and may skip your listing for another home. Another poor mistake some home sellers do when photographing their properties is to take pictures of the inside of the house while standing outside, usually close to an open window or a doorway. Avoid this type of photos as much as possible as such photographs do not properly depict the interior of your house while also transmitting an empty uninviting feeling that can drive away potential buyers, who may have otherwise considered your home. When a homebuyer clicks on a property listing, they are more interested in knowing the general features of a home. This, however, does not include the aesthetics of your home appliances. Adding such photos can make buyers disinterested of your property, resulting in offers lower than the original asking price.